Measurement Specialties, Inc. (NASDAQ: MEAS) has just released its new M7100 pressure transducer for high volume industrial, engine and vehicle markets. Offering a pressure range from 0 to 150psi up to 43,000psi (3000Bar), this rugged, automotive grade sensor features an operating temperature from -40°C to +125°C. Applications include, but are not limited to: HVAC&R refrigeration controls, off-road vehicle engine control, compressors, hydraulics, energy and water management. Applications include, but are not limited to: HVAC&R refrigeration controls, off-road vehicle engine control, compressors, hydraulics, energy and water management. 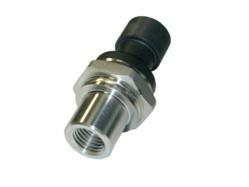 The M7100 pressure cavity is machined from a solid piece of 17-4 PH stainless steel so no o-rings or organics are present that could be exposed to the pressure media. It has a 0.5 – 4.5Vdc ratio metric output and is shipped with a mating Packard connector or Sumitomo connector. Ease of installation is insured with a wide selection of optional pressure port threads. This durable pressure transducer exceeds the latest industrial CE requirements including surge protection and provides overvoltage protection to 16Vdc for both positive and reverse polarity. It can withstand up to 50g shock, 20g vibration, offers excellent stability and has an accuracy of 0.25%. The M7100 is a next generation transducer design that has evolved from many years of field experience that met or exceeded customer expectations. The M7100 combines several innovative technologies that have been developed or acquired by Measurement Specialties since its inception over a quarter century ago. The core pressure sensing technology, known as Microfused™, is used in hundreds of millions of automotive transducers worldwide. It is now accompanied by new ground-breaking, packaging technology to improve hydraulic shock protection. The electronics have been significantly upgraded to ensure signal integrity in electrically noisy applications such as heavy digging equipment or industrial controls with variable drive motors. This was accomplished while minimizing total packaging size and eliminating internal connections to further improve vibration and shock performance. For more information about Measurement Specialties and our products, email pfg.cs.amer(at)meas-spec(dot)com or visit us at http://www.meas-spec.com.